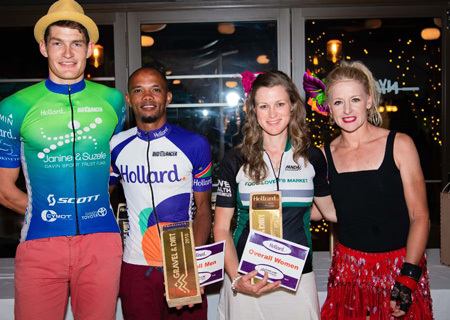 The 2018 Hollard Gravel and Dirt MTB Marathon Series finished in emphatic style this year with a Havana/Cuban theme last week. Gravel and Dirt Series participants attended the night to celebrate the achievements reached by local Namibian MTB riders throughout the 8 race series. This year the Gravel and Dirt Marathon Series offered riders the opportunity to take on the best Namibia has to offer, with races taking place all over the country from the sands in Swakopmund, to rocky paths of Mariental. Riders from far and wide entered into this year’s series to take on the routes that were designed to not only test the resolve of seasoned riders but to also provide a platform for beginners to thrive and hone their skills. Clinton Hilfiker and Wilmien Chamberlain earned the titles of Best Category Performers with their phenomenal achievements over last couple of months, participating in all events and earning the highest overall points per category. Meanwhile, the overall winners for this year’s Hollard Gravel and Dirt MTB Marathon Series were Michelle Doman and Xavier Papo, who truly took on the Gravel and Dirt and dominated from the get-go. Caption – From left to right: Drikus Coetzee, Xavier Papo, Michelle Doman, Irene Steyn (Photography by Renate Wehl).